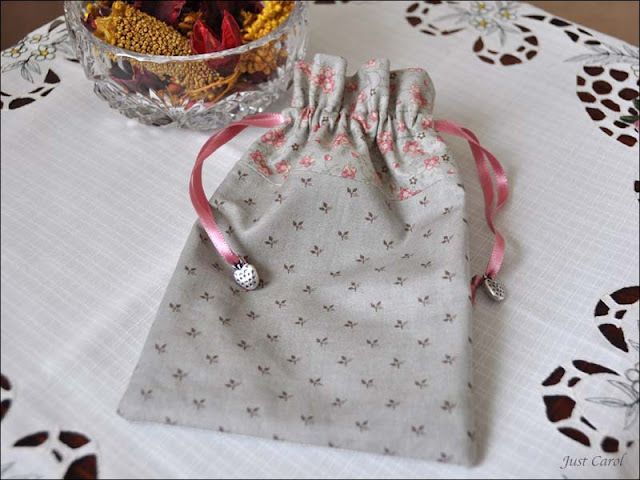 Another little drawstring bag - but not quite as little as the one in my previous post. 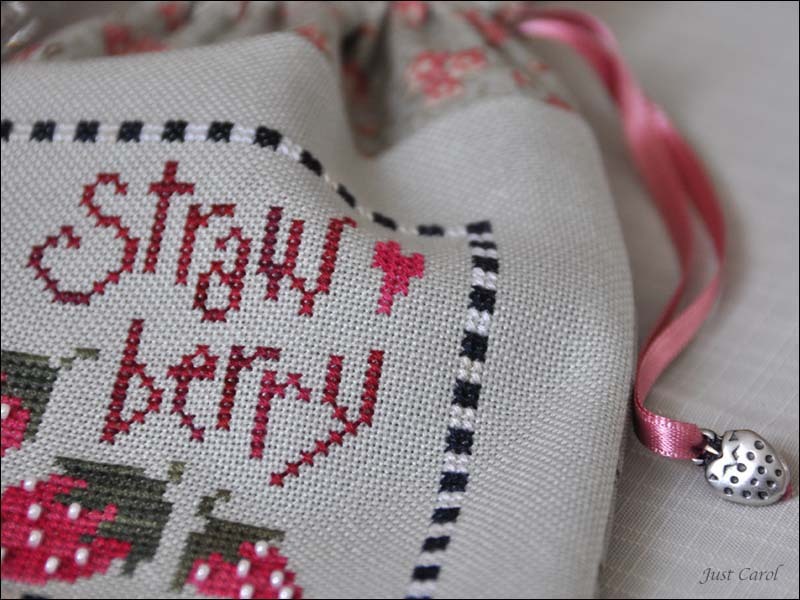 This is Strawberry, a Lizzie Kate freebie which can be found in the files of the Lizzie Kate Yahoo Group. I stitched this one back in 2006 and had always planned to finish it as a lined treat bag the same way that I had finished another of Lizzie Kate's designs some years ago - piccie here. I hadn't planned the fabric border along the top though, until I came across this tutorial from The Floss Box. Julie has recently finished a couple of these lined drawstring bags with the border, which I thought looked really lovely, so I thought it was time to give it a go. Strawberry is stitched on 28ct Star Sapphire Jobelan using the listed Gentle Arts Sampler Threads. Both fabrics for finishing are from Blackbird Designs Garden Party. I've lined it with the same print that I've used for the back. 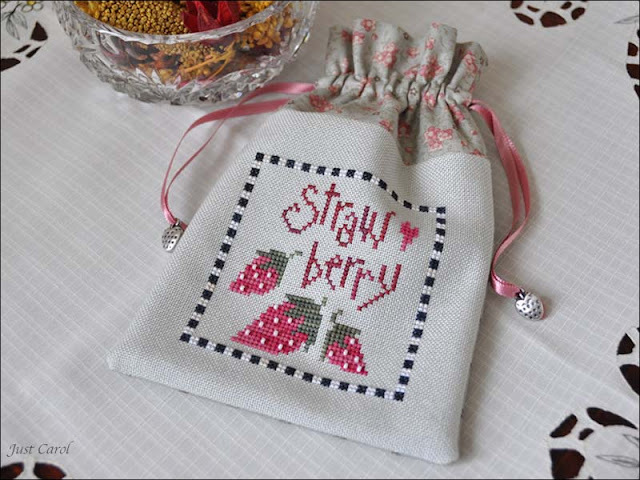 The strawberries tied to the ends of the drawstring ribbon came from Sayila and have been in my stash all this time, waiting for when I would eventually get round to the finishing! Not a lot of stitching being done at the moment as I'm busy with housework, ironing etc., so that everything is up to date for when Colin gets home on Friday - WOO HOO I'm soooo excited!! Today is Mum's birthday and I like to try to stitch her a little something extra, especially when I'm at a loss to know what to buy for her! 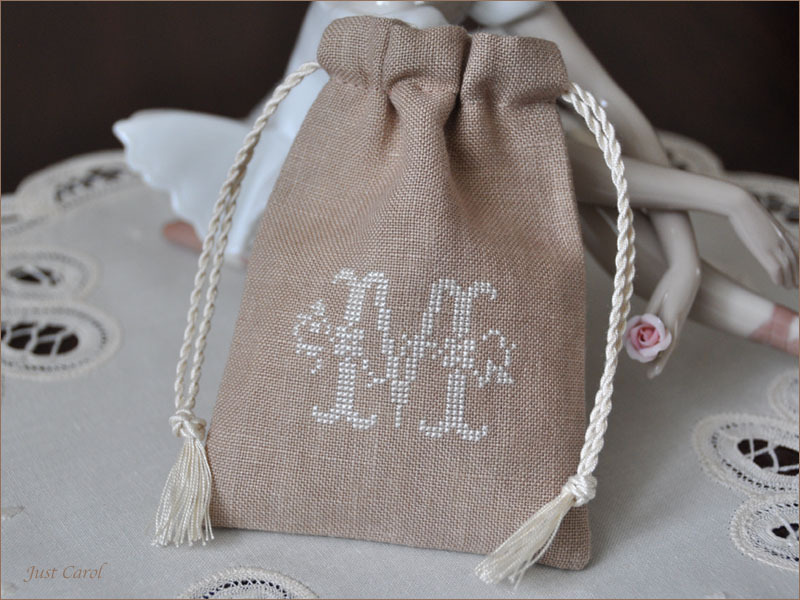 I gave her cash this year and thought stitching a little monogrammed drawstring pouch would be perfect to put it in, along with a Kelmscott Strawberry Thread Keep - another little extra which I'm hoping she hasn't already bought for herself! The alphabet is a Sajou free alphabet, from album no. 107. Stitched 1 over 2 on 40ct Fawn Lakeside Linen with Crescent Colours Vanilla Pudding Belle Soie Silk. The twisted cord was made with DMC 712, Perle Cotton No. 12. What I thought would be a quick little project actually took me a lot longer to put together then I thought! 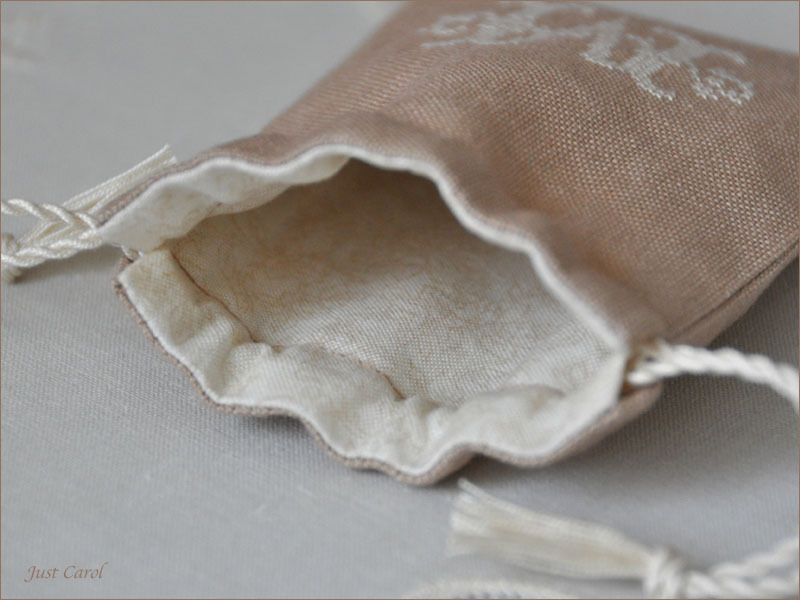 Apart from the two long seams for the lining it was all stitched together by hand - even the opening was too small for me to machine stitch the casing for the cord drawstrings, so that also had to be done by hand! I love the Vanilla Pudding on the Fawn Linen and will be using them both together again for something for me...lol! I hope to be back again soon with another finish I have from my finishing box! It will probably be the last one for a little while as Colin is due home on the 28th. He will have been away for a couple of months so I'm getting very excited and can't wait for him to be home! He will only be home for nine days though, before he's off again for what may be another couple of months! We video Skype most days, which is brilliant - it's free and I get to see him too! Another finish which I stitched last year and have been meaning to make up for a while. It feels so good to be getting a few of my pieces finally completed! 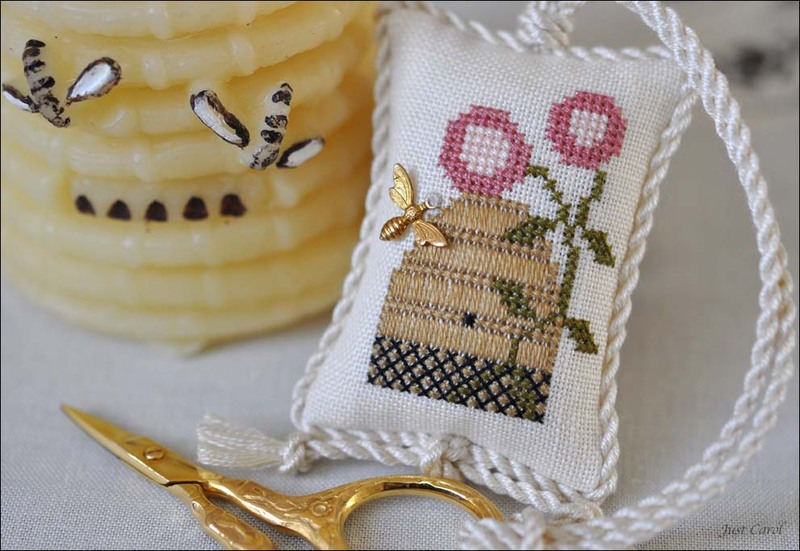 This is Bee Hive Scissor Companion by Ewe & Eye & Friends. The fabric I've used is 40ct cream Newcastle linen. I've stitched it one over two with the recommended DMC threads and for the cord trim I used DMC Ecru.